Wash lettuce and cut into bite-sized pieces. Pat dry. Put on a serving platter and top with oranges in a circular pattern. Combine the oil, vinegar, lemon juice, water, sugar, salt and pepper in a small bowl. Blend. Drizzle the dressing over the salad. Garnish with red onion rings, almonds and pomegranate seeds. Join in and write your own page! It's easy to do. How? 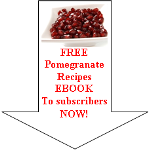 Simply click here to return to Your Favorite Holiday Recipes with Pomegranates.